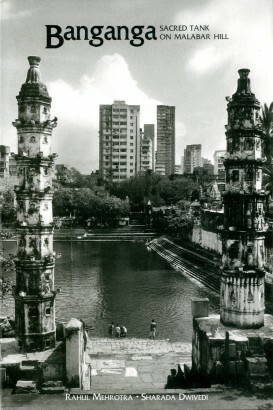 The stepped tank called Banganga, surrounded by temples, the most important being Walkeshwar samadhis (memorials), matths (hermitages), dharmashalas (pilgrim rest-houses) and residences, stands on the western fringes of Malabar Hill, close to Raj Bhavan, the Government House estate at Malabar Point in Bombay. Many ancient myths and legends are connected with the site. The sacred geography of Malabar or Walkeshwar Hill originally derived from several natural phenomena including the ancient and mystical Shri-Gundi or magic stone rock formation, which was reputed to have powers to absolve the sins of those who passed through its fissure. The original Walkeshwar temple and the Banganga tank built by the Shilahara rulers around the 10th century were destroyed, probably during Portuguese rule in the 16th and 17th centuries. The temple was reconstructed in the 18th century on land made available in the vicinity by the British authorities. The intensive development of Malabar Hill from the 1960s has resulted in this historic centre of pilgrimage being virtually engulfed by high-rise buildings. Despite these transformations the complex continues to resist these changes and serves as a sanctuary of calm in an otherwise bustling city.